PRESTO strings combine more than seven decades of string making experience with latest production technologies. PRESTO strings are designed to fulfill highest claims of quality. Only the best raw materials are used for manufacturing. PRESTO Strings – superior quality, great tone, long life. Made with latest technologies and of the finest materials. 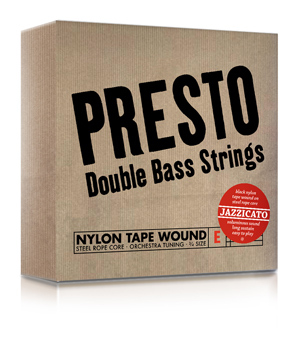 Presto Nylonwound strings for double bass were designed to combine the unique sound of natural gut strings with the convinient properties of steel rope core strings. Unlike gut strings, Presto Nylonwound-strings strings stay in tune under temperature and humidity changes. They also have a short break-in time. Presto Nylonwound-strings have a dark and mellow, but big tone with a strong sustain. They are of comparable low tension. They are an excellent choice for jazz, rockabilly or bluegrass bass players, searching for this particular “old school” double bass sound. Presto Nylonwound-strings have a core of braided steel rope, wrapped with silk and metal wires. Finally, they are wound in a white-translucent polyamid monofil, and polished to a flat, smooth surface. Compared to other steel strings, Presto Nylonwound-strings are of very low tension. They are very easy to play. The thicker gauges and the smooth polyamid-surface lead to a very pleasant playing feel under your fingers. Presto Jazzicato strings are a further development of our popular Presto Nylonwound string. They have a improved steel rope core and a black Nylon wrapping. 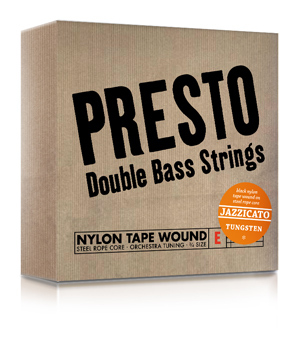 Compared to our original Presto Nylonwound strings, the Jazzicato strings have a slightly smaller diameter. But they still have this smooth surface feel, which makes them different to other steel strings. This particular surface feel and the low tension make the Jazzicato strings very easy to play. The powerful, dark sound, the percussive punch and the unobtrusive sustain give the Jazzicato string their very own character – ideal for Jazz pizzicato, but also suited for Slap bass and Bluegrass. By using Tungsten wire for the wrapping, we were able to give them more tension and sustain than our original Nylonwound strings, but a smaller diameter. This gives the Jazzicato Tungsten a more “contemporary” character. 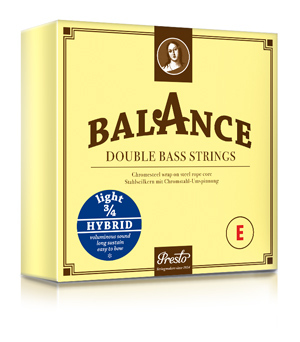 The Balance double bass strings are crafted with steel rope cores and wrapped with chromesteel. They break in quickly and achieve a stable tuning within a very short time. 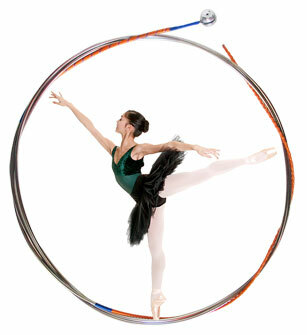 The Balance Orchestra strings are optimized for arco technique. They have dark, powerful sound, and are very easy to bow. Balance Orchestra strings are available for 3/4 string length in Medium and Light gauges (EADG), as well as in Solo tuning (F#HEA). The Balance Hybrid strings are optimized for both arco and pizzicato techniques. Played pizzicato, they have a voluminous sound and long sustain. Nevertheless, they are easy to bow. Balance Hybrid strings are available for 3/4 string length in Medium and Light gauges (EADG), and ½ string length. Presto Balance Fractional are designed for fractional sized double basses. They have a low tension and small diameters, so they are easy to play even for children. They have a steel rope core, wrapped with tungsten and chromesteel. 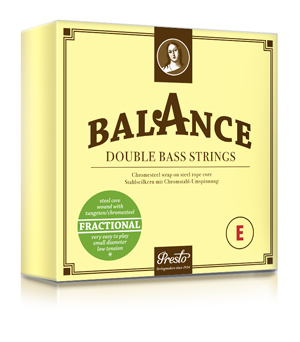 Presto Balance Fractional strings are available in 1/4, 1/8 and 1/10 string lengths. 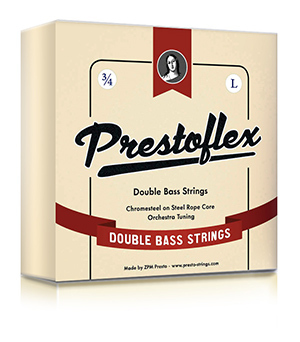 Prestoflex strings are our new versatile steel string. Our design goal was to give them a warm, powerful but even tone in all registers, and a well balanced pizzicato sustain. They also have a very good bow response, so Prestoflex are perfectly suited for both Jazz and Orchestra. Prestoflex are made with a sleek polished chromesteel wrapping on a flexible steel rope core. The "Jazzicato Tungsten" fits my style perfectly. The feel of gut and the mix of gut/ropecore steel in sound. I love it! Just bought your Jazzicato … WONDERFUL! UNBELIEVABLE! They make singing my doublebass as it never did in the past! Bravissimi! Presto Jazzicato - es gibt durchaus vergleichbare Saiten vom Custom - Saitenwickler. Da kostet eine Saite so viel wie hier ein ganzer Satz. Also, liebe Kollegen: wer mal einen Versuch jenseits vom Stahl machen möchte, ohne sich des Darmes Nachteile einhandeln zu wollen, liegt hier richtig. Und man verwende sie auch mal con arco, das geht sehr gut. Einzig die Bezeichnung "jazzicato" ist etwas irreführend. Ganz klare Empfehlung für oldschool - Jazz, Rockabilly und, ja, alte Musik / Renaissance / Barock!! Handschmeichlerisch sind sie sowieso, den Nickelallergiker freut die Nylonumspinnung. Aus meiner Sicht eine sehr gute Verbindung der Vorteile von Darm-, Stahl- und Kunststoffsaiten: Darmsound, Kunststoffhaptik, Haltbarkeit und Stimmstabilität vom Stahl. Und das alles zu einem musikerfreundlichen Preis! Danke! “Smooth”, “velvety” or “soft” are attributes coming to one’s mind at once while playing the new Presto strings. Lately Presto has already made its mark with nylonwound strings. Those who know these strings must know that Presto Balance Hybrid strings persue a totally different aesthetics of sound. When played pizzicato, these strings have quite a natural drive with an articulate attack and a good but nonexaggerated sustain. The strings achieve to transmit the woody characteristics excellently not sounding nasal at the same time, as it is known of many other steel strings. I was really surprised when it came to bowing: Presto strings respond as soft as butter. Even untrained players are able to achieve a wonderful not scratchy sound – that way bowing is fun. During my long-lasting adventure with double bass, I played almost all double bass strings available around the world – both solo or orchestral strings. And only the patriotism overcame definitively my reluctance to test Polish strings. The result? I tried them and I felt enlightened! I must say clearly: Presto Balance strings are super! I am nicely surprised of the high quality level, comparable with the best on the market, acquired the firm Presto, that manufactures strings being capable to meet requirements of the most fussy contrabassists – soloists, orchestra musicians, students of music schools, which often struggle with adversities of play with hard, unruly, market-available strings. I bad been testing strings Balance in solo and orchestra tuning during the last three months – either with using of my Thomas Martin, PölImann and Musima instruments. They were also tested by my students. To my surprise, the strings met their expectations at each instrument very well. And even the cheap Musima double bass turned out to be well-sounding and trustworthy. I am enchanted not only with balanced sound of strings but also with their good intonation. The strings have deep tone and strong warm colour. They splendidly keep the tuning and during playing, they guide into the sound. That fact was a true discovery for me. The strings give a clear sound; if we play halftones – it is a halftone; if we play quartertones – it is a quartertone. The sound and feeling remind me of the T… Sp… Weich (Soft), but the Balance strings are much easier to play with the bow. The sound is punchy warm, slightly dark, though not as dark as the Ev… Pi…’s I had on my bass before. The volume is great, they speak easy. The feeling is like the Spir… Weich or the Obli… feeling: elastic, with a good grip and without the sideward-rolling effect that Obli… can have. The strings are neither thin nor thick, again a bit like Spir…. In the past twelve years I have tried many hybrid strings: D'A… Hel… Hyb…, Cor… tungsten, Pi… Obli…, Pi… Ev… Pi…, even Pi… Oliv…. All things considered, the Presto Balance Hybrid strings gave me most of what I have always liked in gut strings, without their negative sides. Of course they are not gut strings, but if you know how to do it, you can obtain a sound that's close to the gut string sound. Also for 'modern' players they might be a good choice, since it's easy to obtain a long pizz sustain, to play in thumb position and use the bow. If I should give one criticism it is that I found the strings' pizz performance slightly better than their arco performance. On month ago, I decided to test this Presto String Solo tuning. Well, I must be honest, but I thought that surely It could be a normal string, but I have done a great mistake. I have a little "Donato Rubino" double bass (2006) by Neaple School and in one string the first thing I find is a great sound and a good balance among the four strings. Well, the power of string is at very highest level. The first and four string play with the same power and projection. But also the second and the third are at the same level. Usually, in example and in my experience, when I play with P…, I have to change the third and four string with D…, because expecially the tird string doesn't give all the sound I need. With Presto string, this is not a problem !! The sound is well focused on the all four strings and they are very easy to play with bow. The reaction of the string is ready. But on my bass also the sustain is very good, and this is strange on a Solo string. Another thing. On my bass the sound is very sweet and there's no "noise" when with the bow you go from a string to another (In T… string sometime this is a great a problem, and also in C…). What I mean. The "scratch effect" with Presto doesn't exist! Then, the tension is very good for a soloist. In fact it's not too high and not too low. When it's too high probably the string it's easier to react under a bow, but it's terrible for the left hand. When it's too low, the left hand "travels" very easy but the string has no a good reaction under the bow, expecially in Spiccato. Well on my bass Presto works very well. And my first opinion on these strings was totally wrong. And you don't have to expect a lot of time until the go on tuning. The sound is power, well focused, very balanced and rich of harmonics. Now at the beginning of November I start my lessons in Conservatory "G. Paisiello" and I like my students give me their opinion and usually they are very prepared in this matter because we like to choice the right string for each instrument. And there are no overtones or wolf notes, because the string is very well done. No other words! In numbers the main vote is 9/10. A good choice for all the ones which have to play with a solo string.